Riches may be abused, but they are never refused. Honest men do not grow rich in a hurry. Luck is better than money. A lazy boy and a warm bed are hard to separate. Kind words don’t wear out the tongue. Compiled by Julie Jensen McDonald. 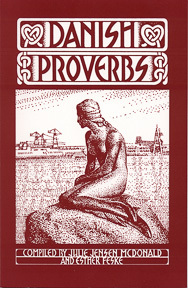 Contains Danish proverbs, written in calligraphy and illustrated in black and white by Esther Feske.